In the last Mac 101 column, you finished configuring your new Mac. 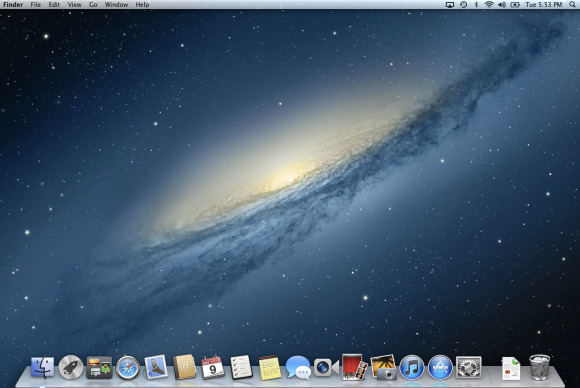 At long last, it's up and it's running OS X Mountain Lion—you’ve arrived! But where exactly are you? And what’s all that stuff on the screen? Your Mac is running an application (also known as a program or an app) called Finder. More often than not, you’ll hear it referred to as the Finder. Given its name, is it a tool for searching your Mac? Not exactly. Way back when the Mac was first born, Apple used a desktop metaphor to help people imagine the way their files were organized. You could think of the Finder as your desk. Inside that desk were folders that held other folders or files. So, by opening a series of nested folders, you’d eventually locate the file (or document) you were interested in working with. So, in this way, the Finder earned its name: It was the starting point for finding your files. But, as things have progressed, fewer Mac users think of it that way. There are far more efficient means for locating files than digging down through a lot of nested folders. And, with the last couple of iterations of the Mac OS, Apple is deemphasizing the notion of folder hierarchies anyway. (But that’s a topic for another column.) For the time being, just think of the Finder as the place you start when you first boot up your Mac. Now let's take a look around. Starting at the top of the window, you find the menu bar. Yep, another metaphor. Rather than forcing you to remember a bunch of arcane computer commands (as was the case in prehistoric times), Apple organizes common commands in a series of menus. Click on a menu heading—Edit, for example—and you see the related options in a menu below. Select one of those commands, and it executes. So, for instance, click on a file, choose the Duplicate command from the File menu, and the Mac creates another copy of the file. I'll discuss menus and their functions in a future column. For now, we’re just taking a look around. In the menu bar you see a number of items. Starting from the left, there’s the Apple icon. This is actually a menu. Unlike the menus to its immediate right, this one is represented by an icon rather than a word. Then comes the Finder menu. This menu is known generically as the application menu, meaning that it contains commands specific to the application you’re currently working with. If you are currently using iTunes, for example, you’ll see an iTunes menu in this same position—just to the right of the Apple menu—and in that menu you’ll find commands that apply to the iTunes application. 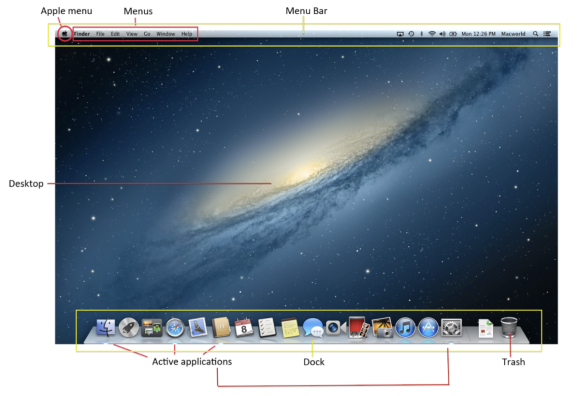 And then there are the regular menus—File, Edit, View, Go, Window, and Help. All of these menu titles (except Go) are commonly found in other applications. And that’s one of the beauties of the Mac OS. Thanks to things like common menu names and commands, you’ll have a certain sense of familiarity regardless of which application you’re using. If you need to copy something, for example, that command will always be found in the Edit menu. If you need help in just about any application, that’s exactly what the Help menu is for. AirPlay Some Mac models can project their sound and video over a network connection to an Apple TV. (Again, don't worry about it now—I'll explain it in a later column.) This menu allows you to choose the device to which you want to send the Mac’s audio and video. You won’t find the AirPlay menu on any but the most recent Mac models. Time Machine Computers crash, and when they do, you can occasionally lose your files. For this reason, it’s a good idea to back up your files. OS X includes a feature called Time Machine that allows you to easily do this. I’ll explain Time Machine in a future column. For now, just know that you can invoke some of Time Machine’s most common commands from this menu. Bluetooth Your Mac can send and receive information wirelessly in a couple of ways. Bluetooth—which is commonly used for communicating between wireless keyboards, mice, trackpads, headphones, and speakers—is one of those ways. AirPort Apple calls its wireless (Wi-Fi) networking scheme AirPort. You use this menu to choose a wireless network to connect to, as well as to turn your computer’s AirPort connection on or off. A black fan indicates that you’re connected to a Wi-Fi network. A gray fan means you’re not. The fewer number of black bars in the fan, the less robust your connection to the network. Sound Click on the Sound icon and you can adjust your Mac’s volume up or down by adjusting the slider. Battery Found on laptops only, the battery icon tells you if your battery is being charged (a lightning bolt icon within the battery tells you that it is, and a plug icon means that it’s fully charged and plugged into an active power outlet) and, if it's not plugged into a power outlet, approximately how much battery power is left. Click on this icon to get a more accurate battery status. Day and time Need to check the time? Glance up at this item. By default you’ll see both the day and time. If you’d like to know the date, click on the time and the date will appear in the resulting menu. Spotlight I mentioned earlier that there are far easier ways to find files than digging down through a folder hierarchy. Spotlight is one of them. Click on the magnifying-glass icon and you can enter the name—or a portion of the name—of an item you’d like to find. A list of results will appear. Click on the one you want, and that item opens. If you’ve chosen a file, it will open in the application associated with it. If it’s an application, that application will launch. Spotlight can be used for many more things, and, as you’ve probably guessed, I’ll devote a column to it in the not-too-distant future. Notifications With Mountain Lion, Apple has corralled many of the alerts you receive into a single location. Click on the Notifications menu, and you’ll see a list of notifications that you’ve received. These can include things like instant-message and calendar alerts, received Mail messages, Twitter messages that mention you, and Game Center invitations.